It’s sad news to hear that they’re closing (m)art but it’s only their South Bank store. And plus there’s a sale, so dry your tears. (m)art’s End of Lease sale ends this Sunday. All the good info is here http://www.artisan.org.au/whats-on/end-of-lease-sale/ While you’re on their site, look to sign up for their newsletter as they hold great craft and design exhibitions all year round. I pop in to as many as I can. I popped into the South Bank shop this week and saw that they have two of my necklaces on sale. A light sky blue necklace with large hollow beads on a natural leather cord, plus a black one made up of smaller beads on black leather cord. Here’s a photo of the last box of necklaces I dropped at Artisan in December. The necklaces mentioned above are in the middle row, left and right sides. 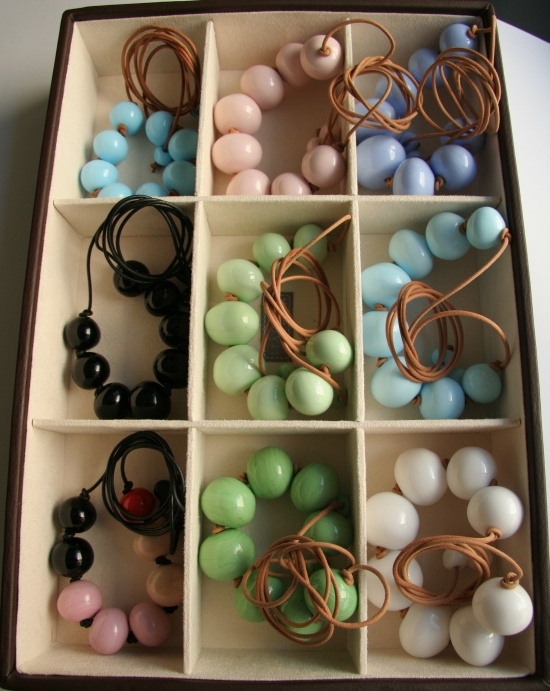 A box of necklaces ready to be delivered to Artisan in December 2012.